With Messages app on the Mac now able to send and receive SMS texts messages alongside iMessages from the iPhone, amongst other configured chat protocols, it’s easy to stay in touch, but it’s also easy get overwhelmed or annoyed by the sound of incoming messages while you’re trying to do other work on the computer. 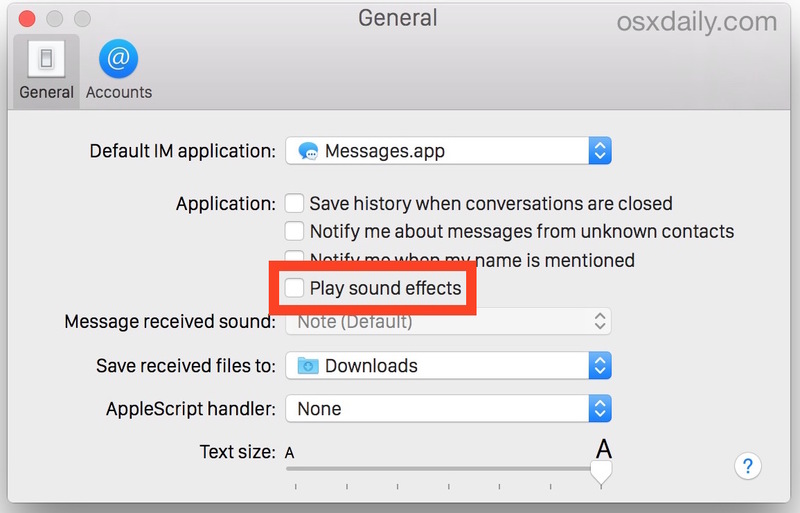 While you can mute Notification Center alert sounds, or toggle Do Not Disturb mode on for a universal relief from all alerts on the Mac, a more appropriate solution is to disable the sounds that Messages for OS X makes. This is preferable to Do Not Disturb for a few reasons; it doesn’t stop the alerts from other applications, and it doesn’t stop the notification of new messages arriving on the Mac, and you’ll still get the little icon badge when a new message is waiting – it simply puts an end to all of the auditory noise that comes from the application pertaining to any messaging event. Keep in mind if it’s only a single conversation that is causing a ruckus you can always opt to mute a specific conversation in the Mac Messages app, which will apply the sound muting specifically to that thread, whether a single contact or a group chat, it works the same. Or, if they’re just an awful person or some unsolicited messager, you can block that sender outright from ever getting ahold of you again. A larger issue to me is when a phone call comes in. It rings my iPhone, my iPad, and my iMac. I’ve disabled sound notifications for FaceTime on my iMac–a simple banner on my iMac is all I want when a call comes, my iPhone ringer is sufficient–but nothing seems to work; all devices continue to ring. Please advise readers on how to turn the Mac ringer off. That’s easy, ‘Bishop’! Just pray!